HARTFORD, Michigan (July 2, 2016) - Wooster, Ohio’s Sheldon Haudenschild held off one of the best in the business for 25 laps on Saturday night, July 2, at Hartford Speedway, clinching a tenth career Arctic Cat All Star Circuit of Champions victory and his first ever at the Hartford, Michigan, half-mile. The pilot of the Southern Pacific Farms/No. 93 started from the pole position and led every lap of the “King of Michigan” program, holding off fellow front row starter Dale Blaney and recently crowned Ohio Sprint Speedweek presented by Cometic Gasket champion Chad Kemenah at the final checkers. 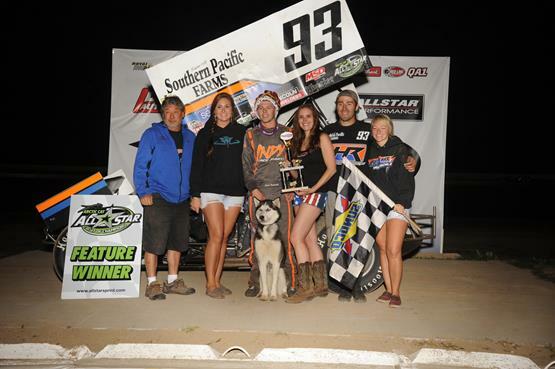 Haudenschild’s Arctic Cat All Star victory, the fourth of his 2016 campaign, was worth $5,000. Clean air and momentum were key elements in Haudenschild’s dominate performance at the front of the field. A perfect jump during the opening green flag allowed Haudenschild to establish both, all while utilizing the very topside of the speedway. Dale Blaney would settle into second, followed by Bloomington, Indiana’s Kraig Kinser at the completion of lap one. By lap five, Haudenschild worked to a sizeable lead over Dale Blaney and Kraig Kinser, only to lose that advantage due to a caution on lap six. Green flag conditions resumed with Haudenschild returning to the topside of the speedway. The distance separating Haudenschild and Blaney returned to a half-straightaway, only to be halted once more for a caution on lap ten. Dale Blaney’s strongest challenge to overtake the top spot occurred during the lap ten restart when the defending Arctic Cat All Star champion dived to the bottom of turn one in an attempt to slide in front of Haudenschild. Haudenschild used momentum to power back around Blaney at the exit of turn two, ultimately resetting his familiar pace at the front of the running order. Haudenschild and Blaney reached traffic for the first and only time on lap 15, each having to negotiate slower cars for three circuits before caution conditions appeared again on lap 18. In the meantime, Danny Holtgraver worked his way to third in the running order from fifth, tracked by sixth row starter Chad Kemenah. One last caution halted the feature field on lap 21, resulting in a last-ditch effort for Dale Blaney. Unfortunately for Blaney, his efforts were not threatening, maintaining second at the exit of turn two. Sheldon Haudenschild went on to win the “King of Michigan” program featuring the Arctic Cat All Star Circuit of Champions. Dale Blaney finished second, followed by Chad Kemenah from 12th, Randy Hannagan, and Danny Holtgraver. Tony Stewart Presents the Inaugural Dirty 30 at I-96 Speedway in Lake Odessa, Michigan, will wrap up Independence Day weekend for the Arctic Cat All Star Circuit of Champions. It will be the final Michigan appearance of the 2016 season for the Arctic Cat All Stars, awarding a $5,000 winner’s share after 30 laps of green flag competition. In addition, the UMP super late models will also be on the Dirty 30 agenda competing for a $1,500 top prize. The evening will conclude with a holiday fireworks display. Dirty 30 at I-96 Speedway pit gates are scheduled to swing open at 2:00 pm on Sunday afternoon, July 3. Main stands will open at 3, with the Tony Stewart autograph session beginning at 4:30. Arctic Cat All Star hot laps are slated for 7. More news and information will be released later in the week. For more news and information, visit I-96 Speedway on the Web at www.i96speedway.com.